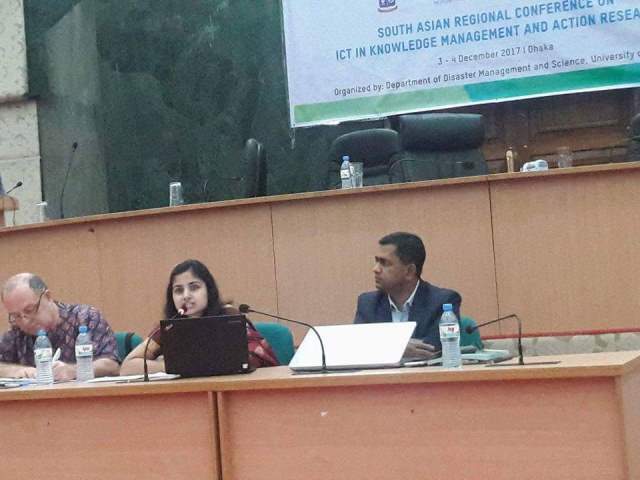 OXFAM Bangladesh, Monash University, Australia and University of Dhaka co-organized the South Asian Regional Seminar on ICT in Knowledge Management & Action Research on December 3-4, 2017 in Dhaka, Bangladesh. The Conference witnessed participation ofover 200 people, coming from varied sectors like academia, civil society practitioners, community, etc. The discussions and deliberations focused on the importance of Participatory Action Research (PAR) as a means for connecting the world of universities & civil society and use of ICT tools in such a research process. The conference gave a platform for professionals from countries like India, Nepal, Bhutan and Bangladesh to come on one platform for sharing their experiences and insights. Several sessions at the conference focussed on various aspects on PAR such as gender equality, natural resources management, agricultural management etc. The Chair’s India Coordinator, Ms. Wafa Singh represented the Chair at the Conference, where she delivered the inaugural address titled ‘Participatory Action Research for Community Development in South Asia’. In her address, Ms Singh outlined the relevance of PAR approaches not only for community development, but also for addressing local challenges, in line with the UN SDGs. Reflecting on the growing footprint of the South Asian region on global economy, she stressed on adoption of such participatory research approaches for production of ‘new knowledge’. She also shared about the UNESCO Chair’s latest initiative ‘Knowledge for Change (K4C)’, and how it aimed to build capacities in participatory research/community-based research approaches.